Do you know when to use IN ORDER TO, SO THAT or TO? I've just published a video to answer a question I had from one of our YouTube viewers, and I wanted to tell you that if YOU have any questions for me, just tell me, and I will do a video for you too! Don't be shy... I want your questions! Why? Because I want these videos to be useful for YOU! Click below to watch the video I made to answer Daniel's question, and learn the difference between 'in order to', 'so that' and 'to'. And remember to put your own English questions in the comments section! We follow 'so that' with a normal indicative sentence and it means "with the result that". Q: Why do you take English classes via Skype? 1. I take English classes via Skype so that I can speak more confidently. 2. I have English classes via Skype so that I don't waste my time travelling to and from an academy. 3. I have classes with a native English teacher so that I hear the perfect pronunciation and the natural language. 1. I have classes via Skype so I speak more confidently. 2. I have classes via Skype so I don't waste time travelling to the academy. 3. I have classes with a native teacher so I hear perfect English. Let's look at some example sentences that an English student might say to me. 1. I study English in order to get a better job. 2. I want a better job in order to earn more money. 3. I want more money in order to provide a better life for my family. Similarly, we can just omit 'in order' when we are speaking. So, when we are speaking , we usually just say 'to'. 1. I study English to get a better job. 2. I want a better job to earn more money. 3. I want more money to provide a better life for my family. ⭐️ SO THAT and IN ORDER TO are more formal and are used more in written English. 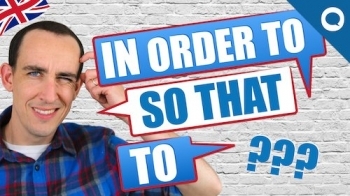 ⭐️ SO and TO are short words – very easy to use – and we use those in spoken English. If you have an English grammar question for me, just write it in the comments below and I'll do my best to answer you in a video!